Engineered to endure industrial applications where pulsation, vibration and shock are present, NOSHOK offers the rugged 900 Series Gauges. These cost-effective, high quality gauges feature a durable 304 stainless steel case with polycarbonate lens, an integrated bezel for panel mounting in the 2-1/2 inch size, and brass or copper alloy internals. They are filled with high grade glycerine to dampen the movement and resist vibration, which also reduces wear on moving parts and increases service life. NOSHOK 900 Series Gauges offer a high accuracy of 1% – 1-1/2%, and are backed by an industry leading 3 year warranty. Ranges are available from vacuum to 15,000 psi, and the gauge is offered in 2-1/2 and 4 inch sizes, bottom or back connected. 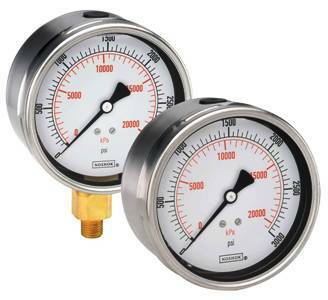 These gauges are available with psi/kPa, psi/kg/cm2 and psi/bar dual scale dials. Other options are available, including ABS case, a variety of dials and process connections, 1-1/2 and 2 inch case sizes, and lens options.